I’m an incurable romantic, (and I don’t want to be cured) so I wrote this page to help all of you who are looking for ideas for a Romantic marriage proposal. You’ve found the one, and you’ve decided to “take the plunge” by “popping the question” of your life and you want it to be romantic…but suddenly your brain has stopped working and you are stumped for ideas on how to ask the object of your heart to spend the rest of her life on earth with you. I am using her because usually it is a man asking a woman. If this is not the case, please simply change all the pronouns to fit your situation. Nothing seems good enough for the love of your life..but you do want this moment to be memorable. Well I have searched the internet to find solutions for you. With all the resources available, there is bound to be the perfect creative idea for the perfect romantic marriage proposal for you to ask your beloved to marry you. When you think about it, there are very few questions that have the importance and the impact of marriage proposals. So even if you have nerves of steel, the thought of proposing to the woman you love may bring on some jitters. But don’t worry. The secret to a successful proposal is very simple: Know what will please her and prepare yourself for the moment. 1: Think about the type of woman she is. If she’s a hopeless romantic, your proposal should take this into account. If she likes bold statements or has a particular passion in life, your proposal could be more creative or extravagant, but if she prefers intimacy, then a private proposal will be in order. But if she adores the spotlight, then a more public proposal may truly win her heart. And if she’s traditional, your proposal should be more traditional too. Think about your relationship and something that is special to just the two of you. 2: Think about setting the scene. It could be just about anywhere-a restaurant, an amusement park, a beach, an art gallery or even a movie theater-as long as it has meaning for both of you. It could be a place you’ve both always wanted to be-from Barcelona to a hot air balloon. 3: Focus on the moment and on her. Whatever stage you set, the most important thing is what you say. Express your proposal with love and sincerity, and let her know how much she means to you. The only real requirement is that it must come from your heart. The focus should be on her, and the special moment you’ll be sharing. If you can’t afford a lavish backdrop, realize that it doesn’t matter. What she cares about is the way you express your love and your desire to become lifelong partners. Know what you plan to say well in advance, and make a statement that captures all that’s special about her. If you just don’t think you can remember to speak the way you would like to, you could give her a poem, especially if she is a tradionalist, or even a romantic note. However you decide to ask, make it special. 4: Prepare for the unexpected. If you’re planning to pop the question in a hot air balloon but thunderstorms make the trip impossible, you’ll have to reschedule for another day-or come up with a back-up plan. Ditto if you’ve invited her for a romantic weekend at a country inn, and she comes down with the flu. Very few things in life ever happen precisely as we plan them, and this is no exception. Take the situation in stride, create a contingency plan and consider this a dress rehearsal for your marriage-which will surely have a surprise or two as well! 5: Know that YOU CAN NEVER BE TOO ROMANTIC. A recent survey reported that 80 percent of women who were proposed to said their proposal was “less romantic” than they had hoped for. So, regardless of how or where you propose, try to imagine what she would want and gear your proposal towards the type of woman she is. but why you love her, why she’s special and the only one for you. Sometimes it can be overwhelming to go to a jewelry store. In my Engagement Ring Store, all the rings are categorized to make it easy to shop. No salesman, no pressure, take your time to find the perfect ring for your beloved. Rings for a Romantic Proposal! Just Click here. Writing a proposal is a time honored way of asking your beloved to marry you. Some people are just shy with words. 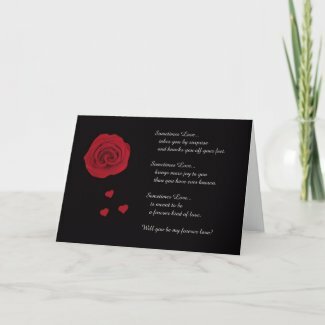 Poetry is a very romantic way to propose! Here are poems to help. By what we freely choose to call our own. That we have made the choice to be alone. To lift my soul ten feet into the air. The years demand not ecstasy but will. One that lasts a lifetime, deep and still. And seek your answer: Will you marry me? A peaceful, sunlit smile that lasts forever. Not fully me unless we are together. In which such thoughts are merely poetry. The glow that shines on you from inside me. Feeling like a candle lights one’s eyes. Striding like a sun across my skies. As long as I can be there when you’re home. Can share the undertow of vanished years. May your love last forever!